And The Verdict Is… Open! President Obama on Monday lifted the ban he imposed two years ago on military trials for detainees at the Guantanamo Bay prison, ending his bid to move most terrorism trials to civilian courts and pushing his already busted deadline for shuttering the island prison indefinitely forward. The reversal came as Defense Secretary Robert M. Gates visited Afghanistan and indicated that he was willing to keep a presence of U.S. forces in the war-torn country beyond the Obama administration’s 2014 pullout goal, highlighting again the difficulty the president has had moving from the policies of President George W. Bush. Mr. Obama announced the Guantanamo decision in an executive order that also sets forth a periodic review process for detainees who have not been charged or convicted but are still considered threats to the U.S.
White House aides stressed that Mr. Obama remains committed to closing the prison, which he has described as a key recruiting tool for terrorist groups, and pursuing some cases in civilian courts. Mr. Obama vowed during the campaign to close the prison by the end of 2009, his first year in office. All of this responds to Obama’s archives speech of May 2009, where he walked back his more progressive January 2009 position but tried to retain a bulwark of detention and prosecution principles for terrorism detainees. Since then, Congress has passed laws blocking the closure of Gitmo by preventing the transfer of detainees by the executive branch. House and Senate Republicans (McKeon and Graham) are expected to introduce bills further blocking detainee access to U.S. courts in the coming week. On a conference call Monday, Obama senior advisors said the president remains committed to closing Gitmo by diminishing the number of detainees held there. But the moves announced today could have the opposite effect, admits a senior White House official. The Bush and Obama administrations have faced repeated habeas corpus challenges to their detention of alleged terrorists at Gitmo. Last I checked, detainees bringing habeas cases were winning by a 4-to-1 ratio. By increasing due process at Gitmo, the new measures make it more likely judges will defer to the executive branch and rule against detainees claiming they are being held unfairly at Gitmo. One administration official argued that judges would not be affected by the new procedures. The habeas releases remain the only way that Gitmo’s numbers can decrease these days. The administration is still debating how to comply with the Congressional ban, but as long as it is in place even a detainee who uses his new due process rights to challenge his detention in military commissions and wins will stay in Gitmo forever… or until Congress changes its mind about closing it down. For years, our federal courts have proven to be a secure and effective means for bringing terrorists to justice. To completely foreclose this option is unwise and unnecessary. So this order doesn’t “completely foreclose” on the rule of law—is a partial foreclosure supposed to count as a moral stand? Given all the nice things the Administration has to say about the federal court system, one would think that it might find it wise, and even necessary, to actually use it a bit more. Instead, the statements seem more concerned to note that the President is not giving up any options or powers—as if bringing accused murderers to court were a prerogative, rather than an obligation. No doubt, Republicans, and some Democrats, have made it hard for Obama to close Guantánamo. But it might be easier if he wanted to do it; the order today makes it sound like he considers it a somewhat useful place. It is not. Speaking of questionable detention measures: Can someone in the Administration explain, slowly and clearly, why Bradley Manning, the soldier accused of leaking the WikiLeaks cables, is required to stand naked in front of his cell in the morning and sleep naked, ostensibly for his own protection? The military’s explanations so far—that he could somehow harm himself with underwear (though he is not on suicide watch and is being monitored by video) so he can’t sleep in any, and then there is just no time for him to put underwear on in the morning before they get him out of the cell—are just not plausible. (By coincidence, a case about Americans being strip-searched after being arrested for minor offenses may be coming before the Supreme Court.) A naked man who hasn’t been convicted of a crime—that shouldn’t be what American justice looks like. Only two years into his presidency, Barack Obama has learned that there are no easy answers to dealing with captured transnational terrorists. It’s easy to create sound bites decrying the evils of holding terrorists at Gitmo, and it’s easy to create sound bites about how awful it is to try them in military tribunals (even though that’s where illegal enemy combatants should rightfully be tried), but it’s very hard to change reality. So bowing to reality, Obama has authorized the re-start of military trials for captured terrorists. The Obama administration’s anti-war campaign rhetoric and naive first-year promises continue to collide with reality. And happily, reality continues to prevail. The Obama administration has finally admitted, I think, that the Bush administration’s decision to detain al Qaeda operatives and terrorists at Gitmo was sensible. It wasn’t driven by some bizarre desire to mistreat terrorists, but instead was the best way to address security concerns without keeping them in Afghanistan or inside the United States. It also turns out that the military commission trials too were a sensible decision. Civilian trials threaten the revelation of valuable intelligence in a covert war where hostilities are still ongoing. Military commissions allow a fair trial to be held but one that does not blow our wartime advantages. Meanwhile, the Obama administration’s track record has been poor — it was lucky to get the limited convictions that it has. Obama folks owe an apology to the Bush administration for their unjust criticism of military trials. It should also be noted that Obama did not come to this turnabout after reasoned consideration alone. I think there are significant figures in the administration that would still love to close Gitmo tomorrow and give every terrorist the same exact trials reserved for Americans who commit garden-variety crimes. Congress dragged the administration kicking and screaming to this destination by cutting off funds for the transfer of any detainees from Gitmo to the U.S. This effectively used Congress’s sole power of the purse to prevent Obama from making a grievous national security mistake. The new Congress should continue to keep the ban in its Defense spending bills to prevent Obama from another 180 degree turn. Conservatives committed to burnishing Bush’s legacy were quick to claim vindication, arguing that the decision proved that the detention camp at Gitmo was a good idea all along. But Obama’s decision doesn’t prove this at all. The administration also released an executive order outlining its new indefinite detention policy. Not much has changed from when I first wrote about it a few months ago — the new procedures formally adopt what Karen Greenberg referred to as “the heart of Bush policy” while making the process marginally fairer by allowing individuals detained indefinitely who have lost their habeas cases to be represented by counsel during periodic reviews every six months. The president and the secretary of defense also reiterated the importance of trying terrorists in federal courts, but they might as well be shouting into the wind. The ban on funds for transfers of Gitmo detainees to federal court won’t be going away any time soon, but it’s worth remembering that ban actually ensures that fewer terrorists would be brought to justice than would be otherwise. Only six terrorists have ever been convicted in military commissions, compared to hundreds in federal court. Failing to close Gitmo remains the most visible symbol of the president’s failure to reverse the trajectory of Bush-era national security policy, but the reality, as Glenn Greenwald notes this morning, is that most of the substantive decisions adopting Bush policies were made long ago. 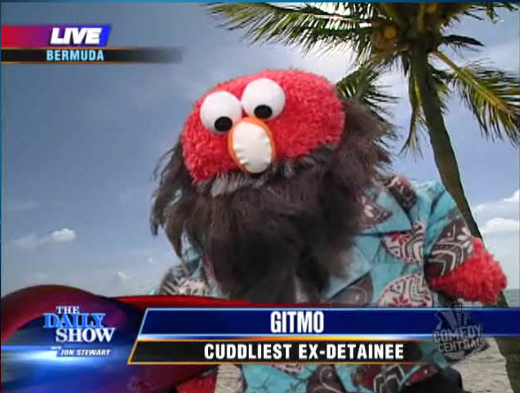 The new policies don’t amount to a “reversal” on the issue of whether Gitmo should be closed. Republicans are eager to portray Gitmo staying open as a “vindication” of the prison’s usefulness, but the fact that the indefinite detention order is limited to detainees currently at Gitmo means that the administration won’t be reopening the facility to new detainees, as Bush apologists have suggested doing. Gitmo isn’t open because the administration doesn’t want to close it, although its efforts in this area are ripe for criticism. It’s still open because Republicans in Congress successfully frightened Democrats in Congress out of giving the administration the necessary funds to close it when they had control of Congress. In the process, they’ve managed to obscure the original reason detainees were brought to Gitmo — to keep them away from the scrutiny of the federal courts. Once the Supreme Court held that federal courts had jurisdiction and even habeas rights, the facility was useless for that purpose. Republicans are determined to keep it open not because we can’t safely imprison terrorists in the U.S., but because they feel its ongoing presence vindicates Bush in the eyes of history.